Ultimate Sporting News: Lacasse, la difference! Genevieve Lacasse stoned the top scorers of the U.S. this afternoon to lead Canada to an inspired 2-1 win and claim top spot in Group A. Both teams had already qualified for direct entry into the semi-finals, but the win was important all the same. Canada has now won the last six meetings, dating back to the exhibition series in December. The four-time Women's Worlds champions Americans might be at a loss for answers for this losing streak, but today it was clear Lacasse was the difference. She stopped 44 of 45 shots to earn the W.
"Any game at the Olympics is good to play in," Lacasse enthused. "That was my first Olympic start. I was just excited to be out there with the girls and to contribute to our team win today." "They played a great game," said Kendall Coyne. "I think we did, too, but it was just finding a way to get it over the line. I think we did a good job at the end with that 6-on-5, 6-on-4 for a little bit, but we just couldn't get the puck in the back of the net. We've got to look at it and find a way." In a rivalry where the slightest advantage can make a difference, today's game featured several. Canada was a little bit more disciplined; the U.S. had ridiculously bad luck, hitting no fewer than four posts; Canada stayed calm when the Americans ramped up the pressure; the Americans looked just a shade unresponsive at critical times. Up front, Canada scored both its goals in the second, and Coyne, the diminutive but supremely talented U.S. forward, scored her team's only goal early in the third. She led all skaters with seven shots on goal. "Their goalie played well," Duggan agreed, "but obviously we have to find ways to put the puck in the net. I'm happy with the way we played. We have to fine-tune a couple of things. We have to bury a few of those chances. I'm proud of the way we competed. We fought to the end." A tentative start to the game opened a bit after a terrible line change by Canada that gave Hilary Knight a clear breakaway. She was stopped by Lacasse, but from there on Canada had the better of play in the period. Meghan Agosta was at her best, and she got Canada’s game going by coming out of the corner and trying to jam the puck in. Maddie Rooney held her ground, but Canada seemed energized by the aggressive play. Both teams had a power play, and both came as a result of similar plays—the attacking team getting the puck deep, and a defending player forced to take her man with extra vigour. Neither advantage produced a goal, though. Canada got the opening goal at 7:18 of the second on its second man advantage. A nice backpass by Natalie Spooner to the side of the goal found Agosta in front, and her shot trickled under Rooney. "I was driving it wide and got below the goal line," Spooner detailed. "I saw my players going to the net, so I figured I'd kind throw it and one of the would hopefully tap it in." That got the attention of the Americans, who carried play for several minutes and created two great chances. Monique Lamoureux went in alone only to be stoned by Lacasse, and soon after her sister Jocelyne drilled a shot off the bottom of the post that had the goalie beaten. Canada made it 2-0 on a shot Rooney would like to see again. Sarah Nurse came down the left side on a three-on-two, and being cautious fired a shot on net rather than risk a turnover off an intercepted pass. Her snap shot found the top corner to the short side at 14:56 to give Canada a bit of a cushion. The rest of the period was dominated by the Americans, who did everything humanly possible to score. One mad scramble saw Haley Irwin deny a goal with a skate save in the crease after two fantastic saves by Lacasse, but in the ensuing mayhem Renata Fast put her hand on the puck, resulting in a penalty shot. "Lacasse absolutely stood on her head," Irwin enthused. "Not only did she make some really big saves, but some timing saves as well. She gave us all the confidence in the world. I made a little bit of a save as well. I guess I learned it from her!" Jocelyne Lamoureux took the freebie, but she ill-advisedly tried a trick play that backfired. The Americans continued to pour it on, though, and Brianna Decker fired another shot off the post that came back underneath Lacasse. Despite being on their heels for so long, Canada almost scored in the dying seconds, but a quick shot by Jillian Saulnier was nicely stopped by Rooney. Coyne got the Americans into the game early in the third, though. She showed a terrfic burst of speed through the middle and snapped a perfect shot between the pads of Lacasse just 23 seconds in, igniting the U.S. bench and setting the stage for another wild finish between these two great rivals. Canada broke, but it didn't bend. 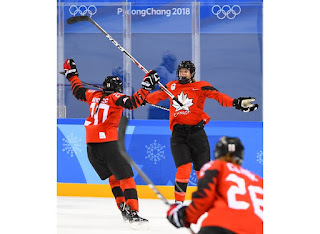 The team played excellent defence while not trying to sit on the lead, but in the final minute all hell broke loose in the Canada end with Rooney on the bench for a sixth skater. Decker hit the post again in the final seconds, and Knight had a seeing-eye pass slide between her skates and stick, narrowly missing a one-timer to the open side of the goal. A crazy scramble as time expired saw Lacasse hold the fort, and teams skated off ice after another exhilirating and emotional battle. "I just kept the puck in front of me," Lacasse said of the mad finish. "I made a couple of saves. The girls were trying to box them out. I kinda got shoved into the net there at the end but I just kept the puck in front of me." They can now sit back and practise for four days while the rest of the pack sorts out who will join them in the semi-finals next Monday.